Viewing TVPS from the street. 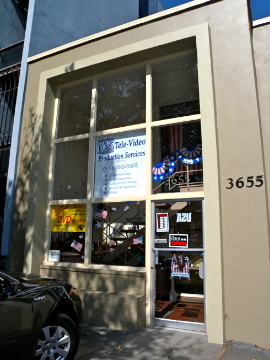 Established in 1979, Tele-Video Production Services is one of the premiere video production companies in the Bay Area. Today we offer services in all areas of video production with a focus on 2 main areas; legal video and general production services and duplication. Legal Video encompasses videotaping depositions, providing true and accurate copies of the proceedings, encoding video to MPEG for use in Trial Director, Sanction and other trial presentation software. Synchronizing video to the transcript (Text Sync) making desktop editing of the deposition simple for the law firm. We also edit depositions as per page line designations provided by the client, often with fast turn around for next day presentation in the courtroom. 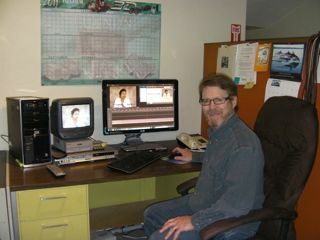 Jim Partridge at one of our studio’s editing suites. We offer fast 24-hour turn around on most DVD duplication jobs (up to 200 DVD copies) as well as most videotape to DVD transfers. 24-hour turn-around is not always guaranteed, it is always based upon the given day’s workload, but we always try, and usually succeed! We also videotape events and corporate training sessions in the Oakland, San Francisco, and Walnut Creek areas. We are located at 3655 Grand Avenue in the Grand Lake district of Oakland, two blocks from the Grand Lake Theater, just past Mandana, on the left-hand side when traveling towards the hills on Grand Avenue. Unfortunately, there is no parking in our driveway, but there is ample street parking and we always offer to pay your meter so you can park for free! 10:00 am – 5:30 pm.